She is under house arrest in Faridabad after a court stayed her transit remand to Pune. 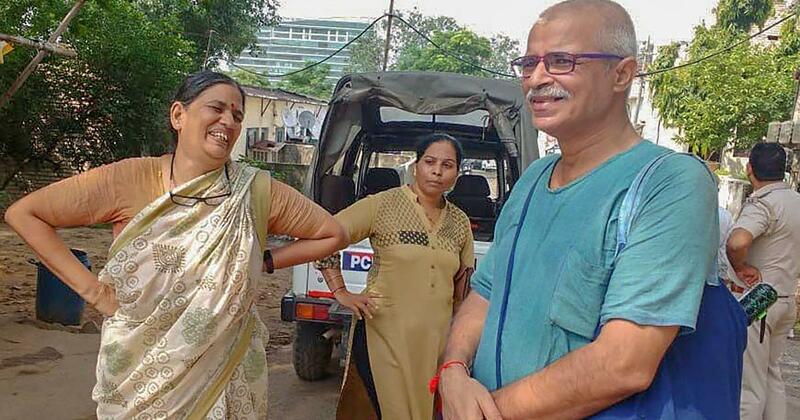 Activist Sudha Bharadwaj, who is under house arrest in Faridabad, said on Wednesday that police had seized her mobile phone and laptop and taken her email and Twitter passwords, PTI reported. “I apprehend they are going to play around with this data,” she told reporters. Bharadwaj is a human rights lawyer who has worked for several decades in Chhattisgarh. She was arrested on Tuesday in connection with an investigation into a public meeting organised before caste-related violence erupted at Bhima Koregaon near Pune on January 1. Bharadwaj is among several activists whose homes were raided by teams of the Pune Police across the country on Tuesday morning. Apart from hers, the homes of Vernon Gonsalves, Arun Ferreira, Gautam Navlakha, Stan Swamy, Varavara Rao, Kranti Tekula, Naseem and Anand Teltumbde were also raided. By the evening, at least five of them, including Bharadwaj, were arrested. Bharadwaj said the “present regime” was targeting those speaking against human rights violations and fighting for the rights of Dalits and adivasis. Police officers are deployed outside Bharadwaj’s residence, and she is allowed to meet only her lawyer. “I think whatever is the opposition to the present regime, whether it is on Dalit rights, tribal rights, or human rights, everybody who is in the opposition is being rounded up in this manner,” she said. In a plea before the Punjab and Haryana High Court on Tuesday, Bharadwaj’s lawyers had said she was given arrest documents in Marathi, which she does not understand, and that the First Information Report based on which she was arrested did not name her.